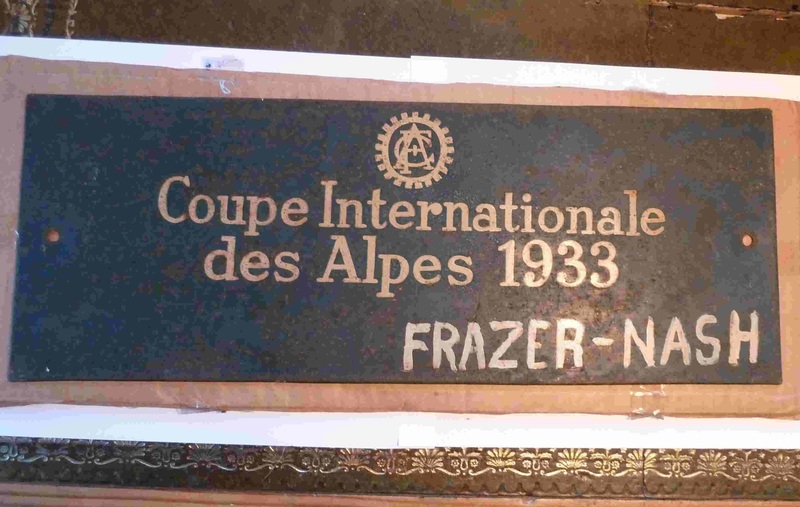 Thanks to the generosity and foresight of Club member Robin Hill, three trophies and a 1933 Alpine Trial plate have arrived at the Archives to join others once owned by Arline Needham. She was one of a small but special band of plucky ladies who drove and competed in Frazer Nashes in the 1920s and '30s. In 1933 she joined forces with Mrs. Gripper to compete on the Alpine Trial of that year. Unfortunately, they had to retire part way through the event due to mechanical problems. The story of how these came into Robin's possession is most interesting. Some years ago, Robin and his wife Sandra were in Melton Mowbray in their Frazer Nash and were approached by someone who introduced himself as Arline Needham's son. He extended an invitation to the Hills to visit his home to see the Needham trophy collection which, it later transpired, was sold to none other than John Aldington, founder of the Frazer Nash Archives. Robin was offered the opportunity of purchasing a few of the items and these he has now very kindly passed on to the Archives.